Tick the check box for Auto-Learn. Set the minimum length of words to be learned. If words are very short there is no point learning them. NOTE: If you set the value to , this means no words will be learned, but the existing entries can still be used for prediction. Set the Max Auto-Learn items number to cache. If a word or phrase is learned by mistake, you can edit or delete it here. 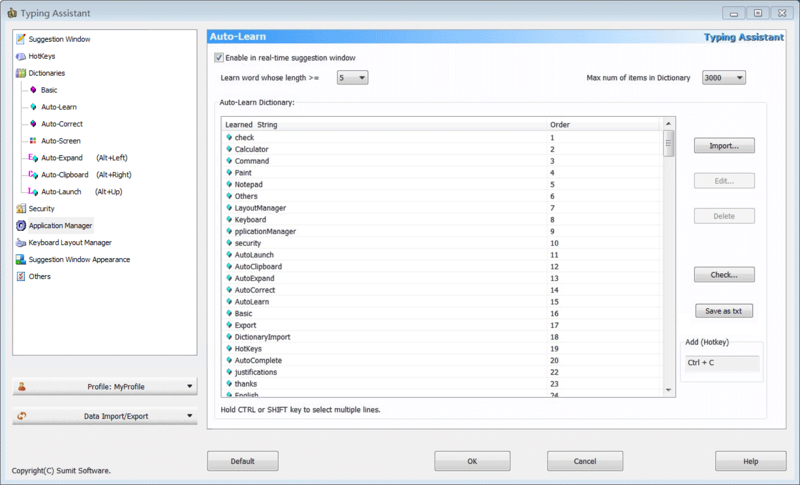 And by using the Delete All button you can remove all items in Auto-Learn dictionary. You can add your own words/phrases to Auto-Learn dictionary, or just copy some texts from any other place and let Typing Assistant picks up the words for you. By this function, anyone can build a dictionary for himself. 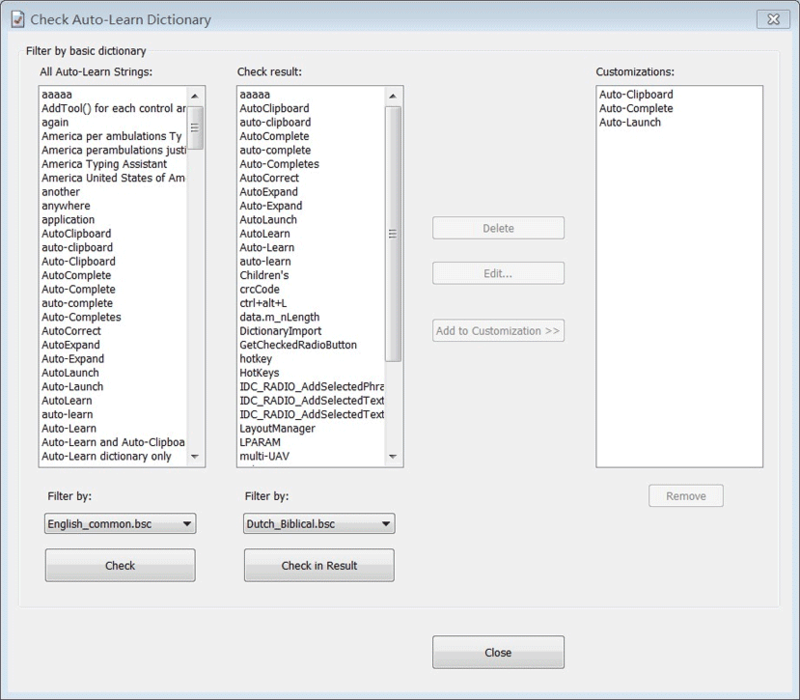 By checking, the AutoLearned words that not in basic dictionary can be filtered. Use the "Check in Result" button to filter by multiple dictionaries. You can delete or edit the check result words, or add them to Customizations to prevent them from being filtered next time(Customizations means these words can't be regarded as misspelled words, but usually used, such as your name, or your street, etc). 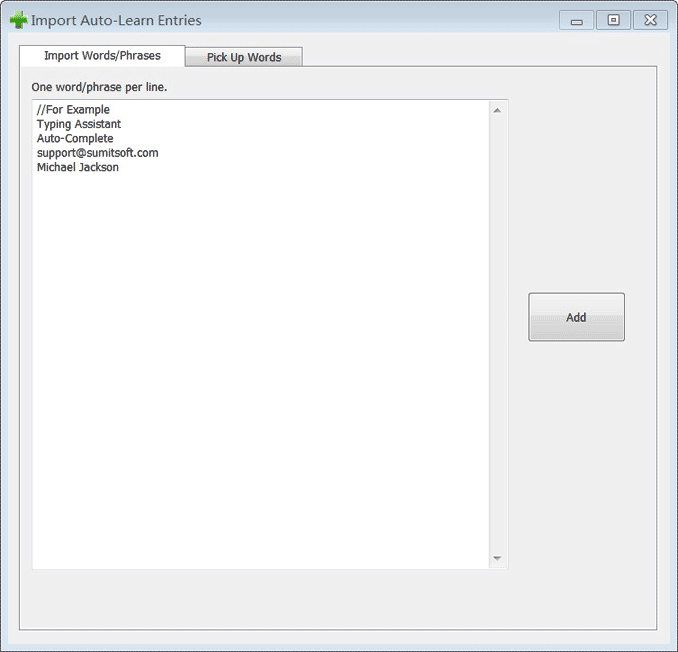 Save Auto-Learn dictionary to a txt file. You can edit the txt file freely and generate a basic dictionary file of your own for Typing Assistant accordingly by our tool Basic Dictionary Generator. Select a word/phrase, and press this hotkey to collect it. This hotkey is defined at "HotKeys" page.